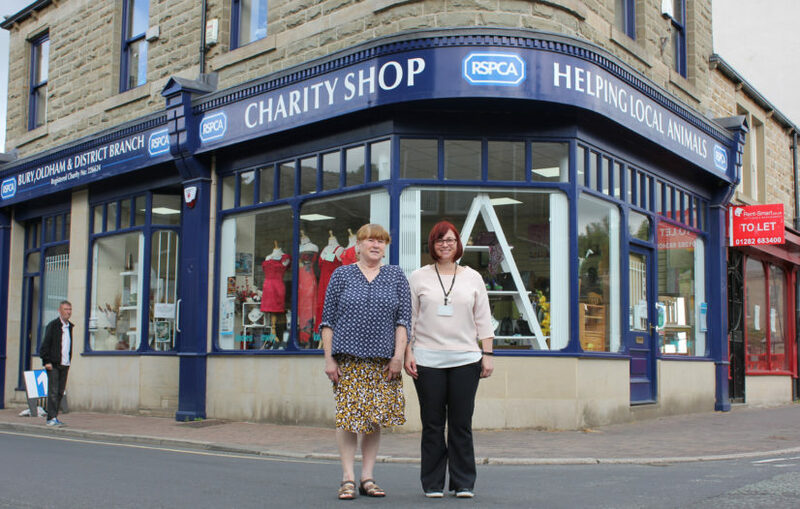 ‘One of the nicest RSPCA shops’ that’s Bacup manager Caroline McCartan described the town centre premises thanks to Townscape Heritage Initiative funding. The landmark building, in its prominent position on the corner of Union Street and St James Street, is a focal point for drivers entering the town from the Rochdale direction. Rossendale Council secured £2million of Heritage Lottery funding to improve Bacup’s built and cultural heritage in 2013. The RSPCA shop closed just after Christmas 2015 for the facelift, but contractors soon discovered the building needed much more extensive work than just external repairs. Caroline said: “We were due to get a new front, new windows, external shutters removed and some internal work. As a result the historic building was closed until the summer of 2016 and as the shop had to be cleared, all the donated items went into storage or to the charity’s other shops to be sold. “When the work was nearing completion people were telling us that the shop was ‘too posh to be a charity shop’ and they thought another business would be taking it over. “We were worried because we had to close the business for so long. However when we did reopen, many of our former customers came in with lots of items that they said they had been saving for us. “It is one of the nicest RSPCA shops. Customers comment on how bright it is and it is a nice place for staff to work. “When the THI money was announced for Bacup, I didn’t really know the difference it was going to make, but it has been better than I expected. The RSPCA building has had a colourful history with a variety of owners and uses. It features in the Heritage Lottery funded Bacup Town Trail, which reflects the wartime use of buildings – in 1917 it was a men’s and boys’ outfitters known as CASH Clothing. Caroline appealed for more volunteers to help run the shop and more donations of any unwanted items. The final part of the HLF funding, this time on public realm, is being currently being carried out in Bacup.